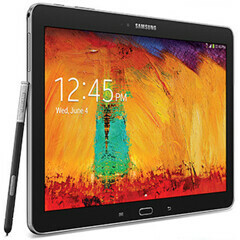 T-Mobile USA today announced that it would launch the Samsung Galaxy Note 10.1 2014 Edition starting June. Don’t let its name fool you, though, as the tablet was initially released in some markets in October 2013 (Wi-Fi only version). Unfortunately, T-Mobile didn’t say how much it’s going to ask for its new Galaxy Note 10.1. Anyway, customers can sign up for more details at the second source link below. Sporting a 10.1-inch display with 2560 x 1600 pixels, the Galaxy Note 10.1 isn’t obsolete yet, despite the fact that Samsung recently released the newer and larger Galaxy Note Pro. To learn more about the Galaxy Note 10.1 2014 Edition, you can read our review of it here. They released it too late. I want something newer now. All these LTE tablet variants (T-mobile, ATT, VZW, etc) show a fundamental stupidity by Samsung. Instead of making a separate LTE tablet for each carrier, Samsung should: (a) include an LTE radio that handles more bands and works with many carriers (like the iPad) (or) (b) have a pluggable LTE radio on the back or side of the tablet behind a nicely done panel or port cover, so the user can plug in whatever LTE they want. Obviously (a) would be preferable, but even (b) would be far superior to having all these variants and the costs of making/testing/supporting them. The other thing that would be nice with (b) is enabling any Samsung table to be LTE upgradeable. It is really bad for business to segment the market into separate wifi/LTE models. Yeah. LTE for the whole world, not just one region. And (c) LTE with software switch. You disable those LTE bands you don't need.